A drink driver crashed a car, and then fled the scene across fields in freezing temperatures, police said. 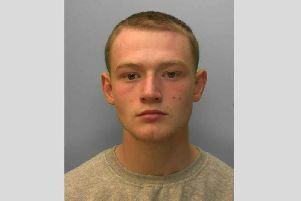 Sussex Police said Henry McKeever was later located at the BP petrol station in Mill Road, Brighton, covered in mud, cuts and grazes. He had made his way across country without any shoes, and had a large tear in his jeans, which were soaking wet. Police said the 26-year-old, who is unemployed and of no fixed address, had earlier driven a black Volkswagen Golf northbound on the A23 at Pyecombe, close to the junction with the A273, where it collided with the rear of a black Alfa Romeo 159. The incident occurred on December 9 shortly after 2am, and McKeever was arrested at the garage at about 2.45am. He was just about to leave in a taxi when he was stopped by police and taken into custody. Police said he was disqualified from driving for 23 months and sentenced to a 12 month community order at Brighton Magistrates’ Court on December 28. He was also ordered carry out 120 hours of unpaid work and pay £85 costs. McKeever is among 46 people so far convicted as part of Surrey and Sussex Police’s Christmas crackdown on drink and drug-drivers. A total of 195 arrests were made during the campaign, which ran from 1 December to 1 January. - A man arrested on suspicion of drink-driving offences twice in two weeks has received a suspended prison sentence. Ridley Njinyam, 35, a warehouseman, of Salvington Road, Crawley, was arrested in Longwood View, Crawley, on December 11, and again in Pelham Drive, Crawley, on December 22. On both occasions, he failed to provide a sample of breath or blood for analysis, and was subsequently charged with two counts of this offence. At Brighton Magistrates’ Court on December 26, he was sentenced to eight weeks in prison, suspended for 12 months, and disqualified from driving for 30 months. He was also ordered to pay a £125 fine, £170 costs and a £115 victim surcharge. Njinyam had only passed his driving test on November 22. - Amy Bourne, 29, a care assistant, of The Spinneys, Lewes, was arrested in Falmer Road, Brighton, on December 2 and charged with driving with 80mcg of alcohol per 100ml of breath in her system. At Brighton Magistrates’ Court on December 21, she was disqualified from driving for 20 months. She was also ordered to pay a £200 fine, £85 costs and a £30 victim surcharge. - Mihail Ropot, 31, a factory worker, of Chichester Road, Bognor Regis, was arrested in High Street, Bognor Regis, on December 2 and charged with driving with 49mcg of alcohol per 100ml of breath in his system. At Worthing Magistrates’ Court on January 2, he was disqualified from driving for 12 months. He was also ordered to pay a £340 fine, £85 costs and a £34 victim surcharge. - Amy Scamp, 26, unemployed, of Flaxen Fields, Five Ash Down, was arrested in Easons Green, Framfield, on December 3 and charged with driving with 74mcg of alcohol per 100ml of breath in her system. At Brighton Magistrates’ Court on December 21, she was disqualified from driving for 17 months. She was also ordered to pay a £120 fine, £85 costs and a £30 victim surcharge. - Anton Owens, 29, an engineer, of Penlands Way, Steyning, was arrested on the A283 at Bramber on December 8 and charged with driving with 59mcg of alcohol per 100ml of breath in his system. At Worthing Magistrates’ Court on December 29, he was disqualified from driving for 36 months. He was also ordered to pay a £650 fine, £85 costs and a £65 victim surcharge. Owens was also convicted of drink-driving in June 2012. - Sarah Newton, 33, a catering manager, of Stonedene Close, Forest Row, was arrested in London Road, Forest Row, on December 9 and charged with driving with 69mcg of alcohol per 100ml of breath in her system. At Brighton Magistrates’ Court on December 28, she was disqualified from driving for 17 months. She was also ordered to pay a £223 fine, £85 costs and a £30 victim surcharge. - Ramona Tutulea-Ciobanu, 30, a cleaner, of Farncombe Road, Worthing, was arrested in Marine Drive, Brighton, on December 9 and charged with driving with 54mcg of alcohol per 100ml of breath in her system. At Brighton Magistrates’ Court on December 28, she was disqualified from driving for 12 months. She was also ordered to pay a £186 fine, £85 costs and a £30 victim surcharge. - Natalie Smith, 22, an accountant, of Hythe Road, Worthing, was arrested in Brighton Road, Lancing, on December 9 and charged with driving with 50mcg of alcohol per 100ml of breath in her system. At Worthing Magistrates’ Court on December 29, she was disqualified from driving for 12 months. She was also ordered to pay a £265 fine, £85 costs and a £30 victim surcharge. - Peter Ovenell, 33, a plasterer, of The Halt, Hambrook, was arrested in Felpham Way, Bognor Regis, on December 10, and charged with failing to provide a specimen of breath having attempted to drive, criminal damage, assault a PC and possession of cannabis. At Worthing Magistrates’ Court on December 29, his driving licence was endorsed with 10 penalty points and he was sentenced to a 12 month community order. He was also ordered to carry out 80 hours of unpaid work. Ovenell received 10 points rather than a disqualification as he was in charge of – but not driving – a vehicle. - Krzysztof Matlewski, 44, a refuse worker, of Wish Field Drive, Bognor Regis, was arrested in Marsh Lane, Oving, on December 10, and charged with driving with 81mcg of alcohol per 100ml of breath in his system, driving with no licence and driving with no insurance. At Worthing Magistrates’ Court on December 29, he was disqualified from driving for 20 months. He was also ordered to pay a £600 fine, £85 costs and a £30 victim surcharge. - Jan Zlobinski, 63, a gardener, of Amberley Drive, Bognor Regis, was arrested in Amberley Drive, Bognor Regis, on December 10 and charged with driving with 104mcg of alcohol per 100ml of breath in his system. At Worthing Magistrates’ Court on December 29, he was disqualified from driving for 24 months. He was also ordered to pay a £576 fine, £85 costs and a £58 victim surcharge. - Raymond O’Neill, 59, a postal employee, of Wish Road, Hove, was arrested in Wish Road, Hove, on December 12 and charged with driving with 73mcg of alcohol per 100ml of breath in his system. At Brighton Magistrates’ Court on December 28, he was disqualified from driving for 18 months. He was also ordered to pay a £350 fine, £85 costs and a £35 victim surcharge. - Kofi Takyi, 56, a driver, of Caburn Court, Crawley, was arrested in Brighton Road, Horley, Surrey, on December 15 and charged with driving with 57mcg of alcohol per 100ml of breath in his system. At Crawley Magistrates’ Court on January 3, he was disqualified from driving for 16 months. He was also ordered to pay a £288 fine, £85 costs and a £30 victim surcharge. - Andrew Parsons, 19, unemployed, of Albert Road, Polegate, was arrested in Bexhill Road, St Leonards, on December 15 and charged with driving with 97mcg of alcohol per 100ml of breath in his system. At Hastings Magistrates’ Court on January 3, he was disqualified from driving for 24 months and sentenced to a 12 month community order. He was also ordered to carry out 60 hours of unpaid work, and pay £50 costs and a £85 victim surcharge. - Mihai Roibu, 23, unemployed, of no fixed address, was arrested in Gibson Way, Bognor Regis, on December 16, and charged with driving with 83mcg of alcohol per 100ml of breath in his system, driving with no insurance, and failing to surrender to custody having been released on bail. At Worthing Magistrates’ Court on January 2, he was disqualified from driving for 22 months. He was also ordered to pay a £400 fine, £85 costs and a £30 victim surcharge. - Jillian Miller, 69, a hotelier, of Henfield Road, Small Dole, was arrested in Pound Lane, Upper Beeding, on December 16 and charged with driving with 86mcg of alcohol per 100ml of breath in her system. At Worthing Magistrates’ Court on January 2, she was disqualified from driving for 17 months. She was also ordered to pay a £250 fine, £85 costs and a £30 victim surcharge. -Susan Elderfield, 52, a solicitor, of Harbour Way, Shoreham, was arrested in Harbour Way, Shoreham, on December 16 and charged with driving with 79mcg of alcohol per 100ml of breath in her system. At Worthing Magistrates’ Court on January 2, she was disqualified from driving for 17 months. She was also ordered to pay a £300 fine, £85 costs and a £30 victim surcharge. - Craig Smith, 35, a builder, of no fixed address, was arrested in Sompting Road, Worthing, on December 16 and charged with driving with 50mcg of alcohol per 100ml of breath in his system. At Worthing Magistrates’ Court on January 2, he was disqualified from driving for 12 months. He was also ordered to pay a £400 fine, £85 costs and a £40 victim surcharge. - Liam Egan, 26, a film industry employee, of Beverington Close, Eastbourne, was arrested in Willingdon Road, Eastbourne, on December 17 and charged with driving with 133mcg of alcohol per 100ml of breath in his system. At Hastings Magistrates’ Court on January 3, he was disqualified from driving for 30 months and sentenced to a 12 month community order. He was also ordered to carry out 180 hours of unpaid work, and pay £85 costs and a £85 victim surcharge. - Rowan Harmer, 22, a hairdresser, of Hyde Street, Upper Beeding, was arrested on the A283 at Steyning on December 17, and charged with driving with 56mcg of alcohol per 100ml of breath in his system and driving with no insurance. At Worthing Magistrates’ Court on January 2, he was disqualified from driving for 12 months. He was also ordered to pay a £460 fine, £85 costs and a £30 victim surcharge. - Crystal Page, 27, an animal beautician, of Daniel Close, Lancing, was arrested in Daniel Close, Lancing, on December 17 and charged with driving with 50mcg of alcohol per 100ml of breath in her system. At Worthing Magistrates’ Court on January 2, she was disqualified from driving for 12 months. She was also ordered to pay a £120 fine, £85 costs and a £30 victim surcharge.